Although NASA initially failed to notice it, the Mars Rover has just photographed what looks like clear evidence of the remnants of a civilisation on Mars. Head of a statue on Martian surface? NASA released the photographs taken of the Martian surface without thoroughly scrutinising them. As a result they failed to notice what looks like an ancient Aztec/Mayan style head on the Martian surface. It appears in the photo below. Enlarge the photo, then scroll down on the right hand side and you’ll come across the strange anomaly, which has been isolated and enlarged in the photo on the right. 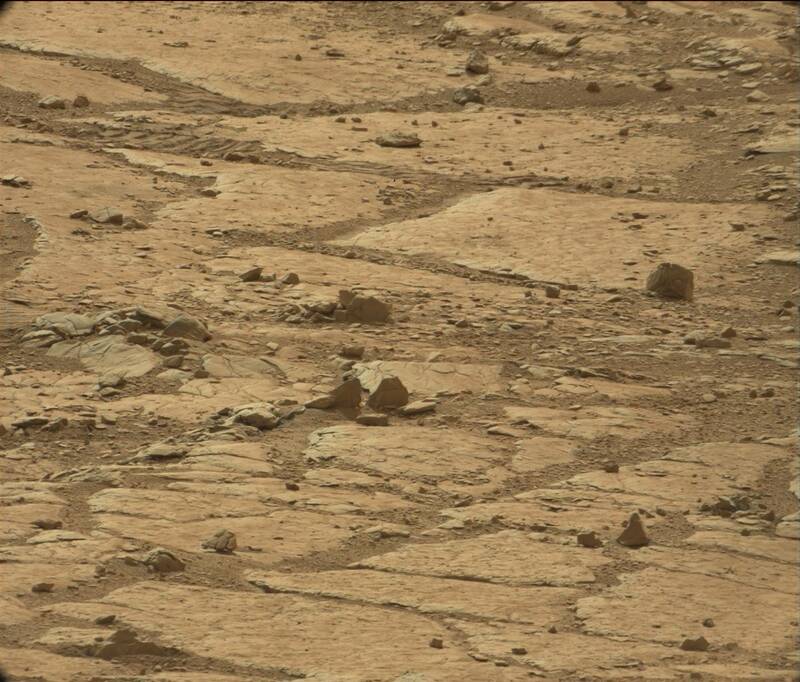 There have long been stories of an ancient human civilisation that existed on Mars. According to GI Gurdjieff, one of the 20th century’s most influential esoteric teachers, Mars had been humanity’s home planet before human civilisation there was destroyed. Thereafter humanity started to incarnate on Earth because, according to Gurdjieff, Mars had been rendered uninhabitable. And note that he didn’t say humanity had been transported here by space ships but that humanity began to INCARNATE here. There is a difference: one is a physical-mechanical process, the other is a spiritual process. Moreover, the destruction of the Martian civilisation wasn’t the result of an “alien” attack. Rather it was a combination of humanity’s own mistakes and wrongdoing, coupled with the workings of higher powers, which ultimately led to planet wide disaster on Mars. In what may be a belated effort to conceal this momentous discovery NASA now says that the Mars Rover is “suffering from memory problems” and that the Rover Opportunity, not to be confused with Curiosity, keeps wiping its own data. A brief statement about the Mayan/Aztec style head on Mars: If the rovers are really on Mars, then there really is an old statue (and probably thousands) of Aztec style carved heads on Mars. Period, end of discussion. The trolls will be fools once word gets out despite their efforts, the cold hard facts are simply too obvious. NASA SCREWED UP, THEY MISSED THIS AND FAILED TO CENSOR IT. 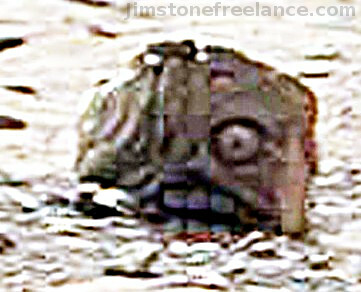 My worries in posting the stone head on Mars were centered around absolute confirmation the original image really did come from the Mars rovers. I was not concerned with whether or not it was in the picture (it so obviously is) and instead focused on making sure I was getting a genuine image from JPL and that Nasa does not do these types of things as a joke. They do not, and the image really is from Mars. 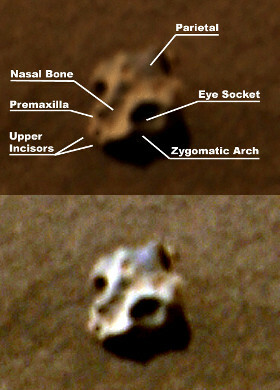 The carved head image now circulating the web was rendered by me over several hours from the original Nasa photo using only standard filters (not edited, only rendered) and did not come from elsewhere. I originally thought the Mars rovers were a hoax running around the desert in Arizona. This is because there were coins, bones, an obvious animal skull and other things showing up in the Mars rover photos. I thought it was all a psy op. But there are no Aztec style carved heads in North America, especially none based on faces that look like they are white, and because one was photographed by a rover I changed my mind – the rovers really are on Mars and they are driving around the surface of a recently destroyed planet that was very much like Earth not so long ago. There are coins from whatever civilization was there showing up in the rover photos, bones, animal skulls and now this carved head. No doubt about it, Mars was inhabited and the superb condition of the relics that have turned up proves Mars was destroyed only a very short time ago.